Told through his eager, enthusiastic eyes with humor, his book is harrowing, uplifting, scary and hilarious. 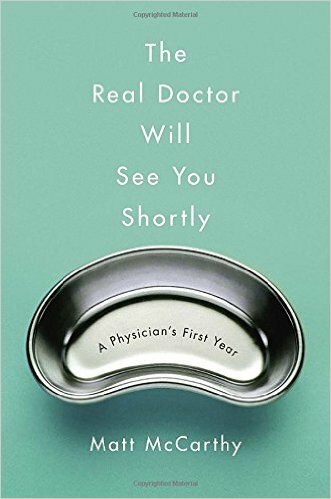 This book covers everything you ever wanted to know about what it takes in becoming a doctor. Whether you’re interested in becoming a doctor, or wish to know what training your doctor had that made him/her a good or bad doctor, this is the book to read. In fact, I’d like to hand out a copy to every patient in order to tell them that their doctor isn’t God. Like us he/she is just a human and they can’t perform miracles. I’d also like to give every doctor a copy in order to remind them of the same. This was an excellent, informative and enjoyable read and I highly recommend it. MATT MCCARTHY is an assistant professor of medicine at Cornell and a staff physician at Weill Cornell Medical Center. His work has appeared in Sports Illustrated, Slate, The New England Journal of Medicine, and Deadspin, where he writes the Medspin column. His first book, Odd Man Out, was a New York Times bestseller. Disclaimer: I received this book from Blogging For Books in exchanged for a fair and honest review.